Human Resource Manager needs to be really very smart and skilful when it comes to writing an employee termination letter for theft. It is not something very easy and sorted as it looks. It comes with its own complications. 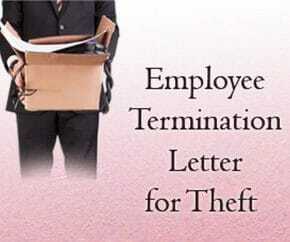 To help you write a formal employee termination letter for theft, here is a format sample which will guide you frame a perfect draft keeping in mind all the essential points. It is my duty to inform you that from today, i.e. January 15, 2015, your employment with ABC Corporation Ltd. is terminated because of your misconduct of company theft. On January 12, 2015, our surveillance cameras have captured you taking out some cash from the chest drawer of the cashier in the finance department. After conducting a thorough examination of this incident, we are convinced that there has been a missing cash of $ 1,000 from the chest and you did not have permission to carry it out. You are aware of the fact that company theft is a serious offense. We have covered the offense in detail in our employee handbook and we have also talked about the same during new employee orientation. Our investigation has uncovered the there have been lots of incidents when cash has been missing from the chest drawer which total to an amount of approximately $5,000. And hence, we have been compelled to report the incident to the local police. You will soon be contacted by a member of the HR department. He will discuss your final paycheck and any other benefit payments you may be due t o clear all the accounts. In case, you feel that we have reached this decision in haste then you are welcome to file an appeal for the same. If you have any questions regarding this then you may contact our company lawyer, Mr. Alice Grace, at 1234-5678. Once the meeting ends then you will be escorted to your desk to retrieve your personal property and once that is done then you will be escorted off the premises.